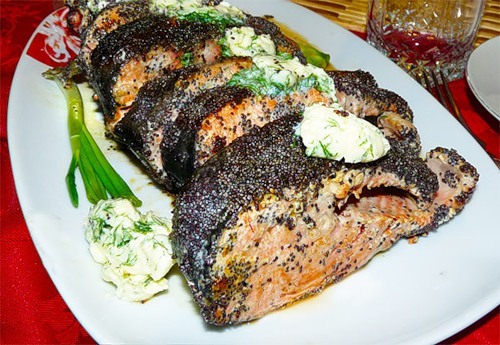 Coho salmon - a red fish, which is useful for children and the elderly. Its meat tender and juicy. Cohoand it is not recommended to use for gastritis and disorders of the liver. In cooking there are many recipes for this fish. On the grill. Using a normal kitchen knife, clean the fish from scales. Slit the belly and remove the guts. Rinse thoroughly under running cold water. Have the fish steaks with a width of 4cm Salt and pepper to taste. Put the fish pieces on the grill. Fry on heat for 10 minutes. Ear. Clean and gut the fish. Cut lengthwise into serving pieces. Peel potatoes, cut into cubes. Carrots grate on a coarse grater. Onions finely chop. Put on the stove a pot of water and place in it the fish. Boil 40 minutes and add the vegetables. At the end of cooking, put in your ear Bay leaf, salt and pepper to taste. Finely chop fresh herbs and add to the pan. Turn off the stove and close the lid. Coho salmon are salty. In vodka add salt and sugar. The fish is cleaned, remove the entrails and rinse under running water. Optionally, you can remove the skin. Cut into slices and coat with the mixture. Then wrap in clean cotton cloth and put it in the fridge. A day later the fish is ready. Fish cakes with mushrooms. Fish clean, gut and wash. Separate the fillet from the bones and mince. Chop the garlic and fresh herbs. Rinse the rice and boil in salted water. Slice onions and fry in vegetable oil until Golden brown. Add products to the mince and mix. Season with salt and pepper. Put in the fridge. Fresh mushrooms clean, wash and finely chop. Heat a pan with a small amount of vegetable oil. Sauté mushrooms until tender. Add salt to taste. Shape mince a small pellet. Mid lay out the mushroom stuffing. The top cover with stuffing. Form a Patty. Fry on both sides until Golden crust. The cutlets spread on cookie sheet and pour on top of tomato sauce. To do this, cut the onion half rings and fry. Carrots grate on a coarse grater. Put to the onions along with the fried mushrooms. Tomato paste to dissolve in water and pour to the vegetables. Of frozen fish is better to cook the stuffing. From the head and the tail of the fish can be cooked in the broth.